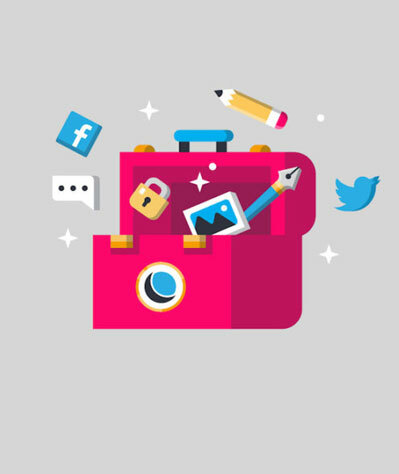 You probably already know that Amelia is one of the top booking specialists for WordPress, perfect for the business owners who want to give their appointment-based business a trustworthy and professional feel. However, what you might have not known is that people behind this useful scheduling system have not rested since day 1, and Amelia constantly keeps getting better. What this means is that new handy features are added to Amelia on a regular basis and at the same time, the old bugs are getting fixed. Without further ado, let’s take a look at some of the latest improvements that make Amelia stand out from the competition. This helps you add new custom fields to your booking form to collect additional information from your customers and to match your specific business needs. The default fields include basic customer information such as their name, phone number, and email address. However, by adding custom fields you can collect additional details that you might need through checkboxes, text areas, and similar. You will never have to search for the latest Amelia updates manually again. Your favorite booking specialist will always be up to date and all the newest features and benefits will be available to you as soon as we release them. 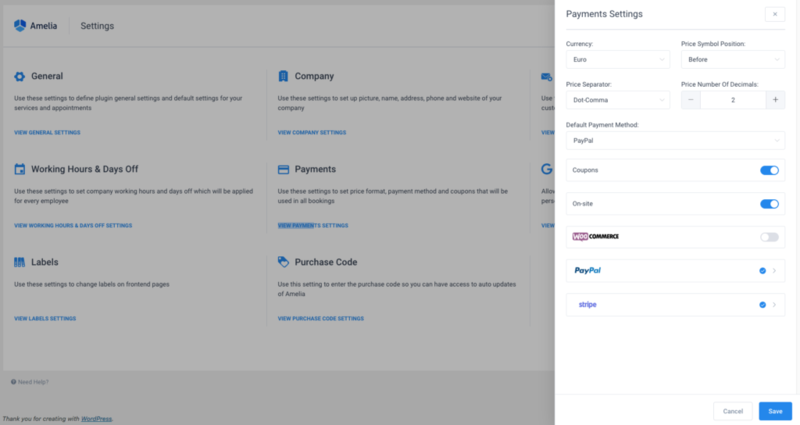 While we improved the payment-related features significantly with the WooCommerce integration, with the newest Amelia updates, you can now select the default payment option of your choice. We have added Spanish, Greek, and German translations as well as the date translation in the notifications. Also, labels settings like “service”, “services”, “employee” and “employees” could be translated using the translation plugins. You can now add a date or range of dates with different working time and services. 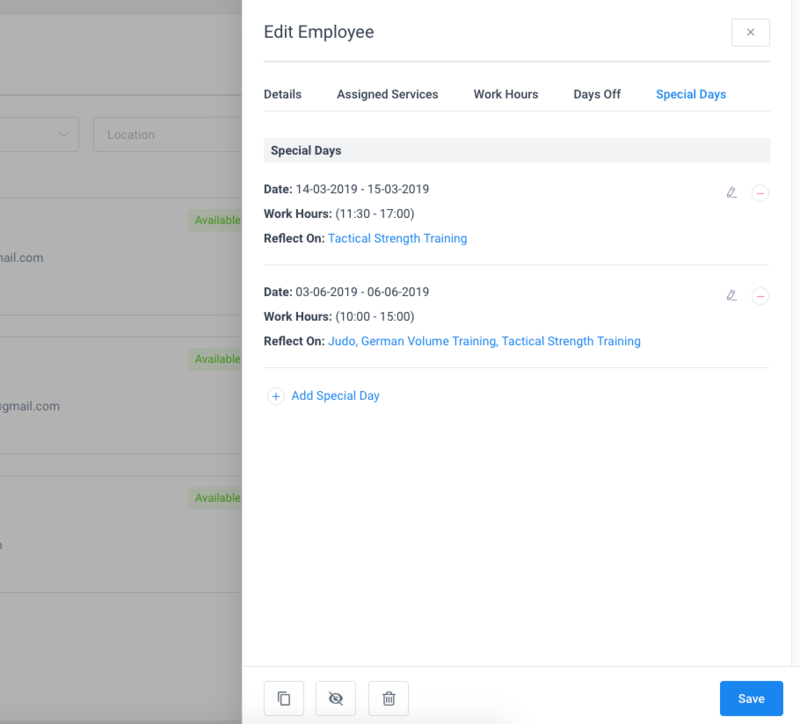 With the latest update, the employees can now add their Special Days as well as their Days Off. You can now set a specific schedule for each service during the employees working hours. For example: if your employee has different services, you can set up how long during his/her day he/she will be working on each. New shortcode options including [ameliabooking category=ID], [ameliabooking service=ID], [ameliabooking employee=ID], [ameliabooking location=ID], [ameliasearch today=1], [ameliacatalog employee=ID], [ameliacatalog location=ID], and other useful combinations. Sending of automatic email when Amelia user is created from WP dashboard. New Options including the option to show booking slots in the client’s time zone, option to set the redirect URL after an appointment is scheduled, option to set Google Calendar event’s name, option to add a description in the Google Calendar events, option in labels settings so “service”, “services”, “employee” and “employees” labels could be translated using the translation plugin, option for automatic creation of Amelia Customer user (it is now possible to create Amelia Customer user each time a new customer makes an appointment), option to check customer’s name for existing email during the booking (you can allow customers to schedule the appointment with the same email but different first and last name), and many more useful options that you might have missed in the previous Amelia versions. Not only by adding useful new features does Amelia consistently becomes better and more user-friendly. A very important part of developing a product comes down to fixing all the bugs that surface down the way. Luckily, people behind Amelia understand how important it is to catch and fix as many bugs as possible. Fixed issue with %appointment_date_time% placeholder in notifications. Fixed issue with scheduled SMS notifications. Solved conflict with other plugins that use Google API. Fixed issue with deleting appointments and customers. Resolved conflict between Amelia, Divi and Yoast plugins. Date Format “jS F Y” fixed. The list goes on and on. However, if you at any point encounter a bug that interferes with your user experience, you are welcome to report it to Amelia team and we will take care of it as soon as possible. If you are a new Amelia user, you might want to know more about other features that make Amelia the leading booking system out there. 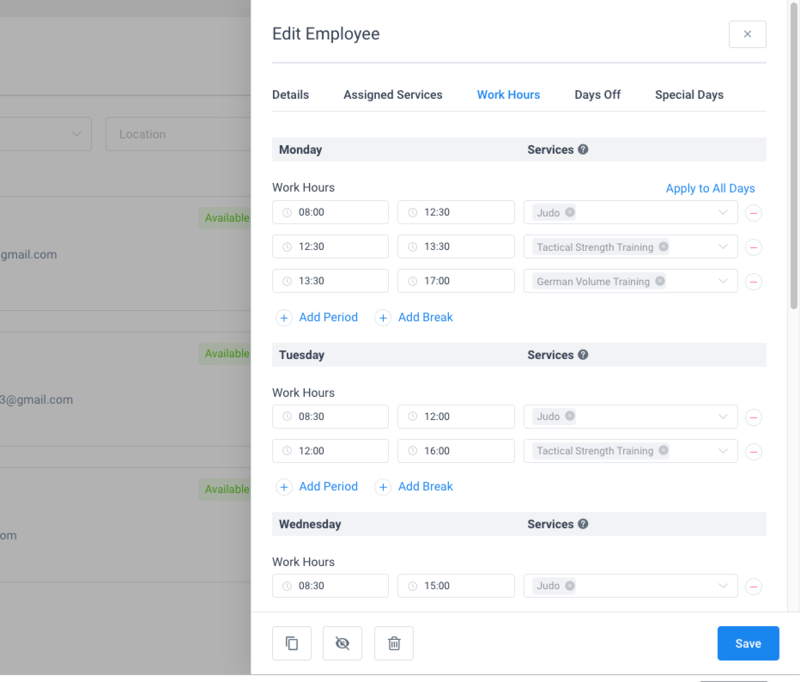 All of these features and more make Amelia the perfect plugin for business owners who run an appointment-based business and want to save all that time that need to put into managing their bookings and schedule. Not only does Amelia make your business look more professional and trustworthy, but it also minimizes the number of scheduling errors and mix-ups; not to mention all that time that you can now use on more important things instead of dealing with your bookings. As you can see, Amelia cares about the users and their experience. Every day, the new cool features are being developed and the old bugs are being fixed in order to give the users the most stable and useful booking specialist they can get. That is a part of the reason why even though Amelia is a relatively new product, it is already one of the favorite booking systems used by the business leaders and small business owners equally. On top of that, with all the recently added features and improvements, Amelia became even better!